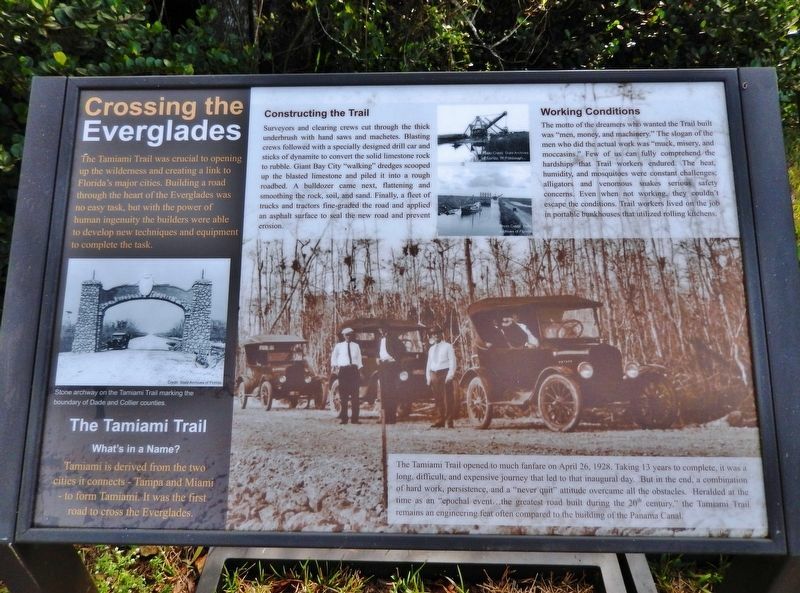 The Tamiami Trail was crucial to opening up the wilderness and creating a link to Florida's major cities. 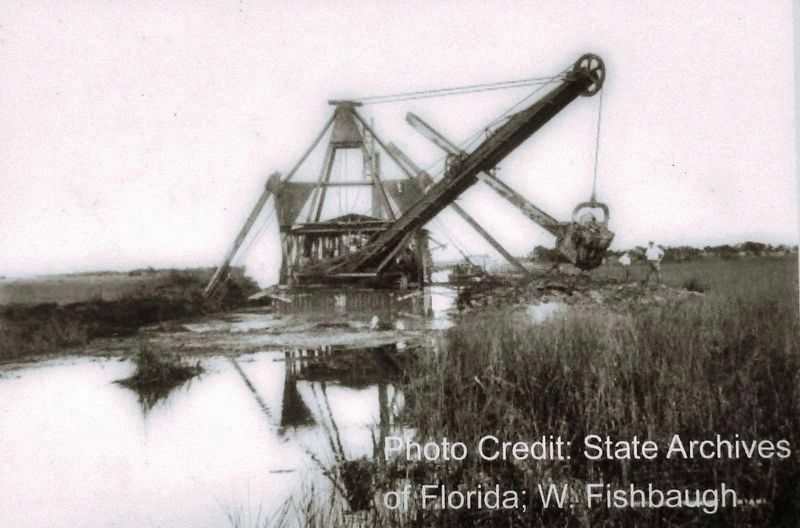 Building a road through the heart of the Everglades was no easy task, but with the power of human ingenuity the builders were able to develop new techniques and equipment to complete the task. Tamiami is derived from the two cities it connects - Tampa and Miami - to form Tamiami. It was the first road to cross the Everglades. Surveyors and clearing crews cut through the thick underbrush with hand saws and machetes. Blasting crews followed with a specially designed drill car and sticks of dynamite to convert the solid limestone rock to rubble. Giant Bay City "walking" dredges scooped up the blasted limestone and piled it into a rough roadbed. A bulldozer came next, flattening and smoothing the rock, soil, and sand. Finally, a fleet of trucks and tractors fine-graded the road and applied an asphalt surface to seal the new road and prevent erosion. money, and machinery." The slogan of the men who did the actual work was "muck, misery, and moccasins." Few of us can fully comprehend the hardships that Trail workers endured. The heat, humidity, and mosquitoes were constant challenges; alligators and venomous snakes were serious safety concerns. Even when not working, they couldn't escape the conditions. Trail workers lived on the job in portable bunkhouses that utilized rolling kitchens. 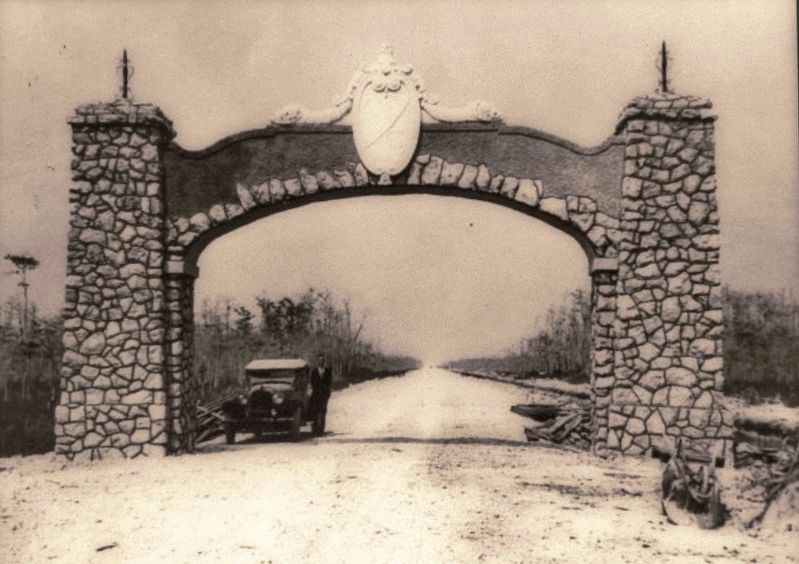 The Tamiami Trail opened to much fanfare on April 26, 1928. Taking 13 years to complete, it was a long, difficult, and expensive journey that led to that inaugural day. But in the end, a combination of hard work, persistence, and a "never quit" attitude overcame all the obstacles. 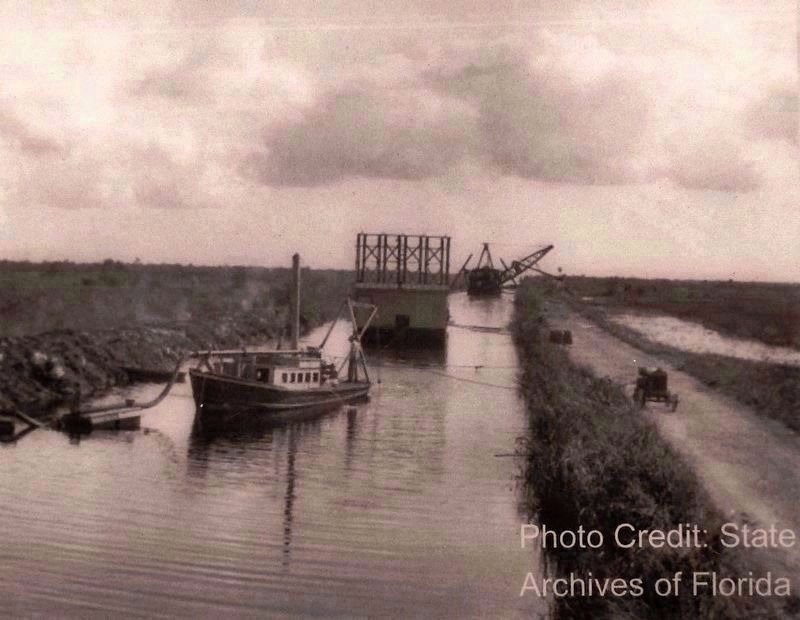 Heralded at the time as an "epochal event… the greatest road built during the 20th century," the Tamiami Trail remains an engineering feat often compared to the building of the Panama Canal. Center. Marker is in this post office area: Miami FL 33194, United States of America. Touch for directions. Other nearby markers. At least 2 other markers are within walking distance of this marker. 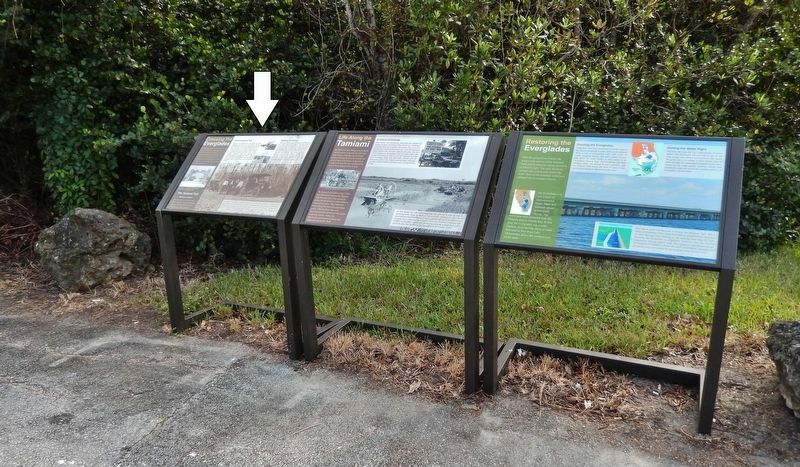 Life Along the Tamiami (here, next to this marker); Restoring The Everglades (here, next to this marker). More. Search the internet for Crossing the Everglades. Credits. This page was last revised on April 14, 2019. This page originally submitted on April 14, 2019, by Cosmos Mariner of Cape Canaveral, Florida. This page has been viewed 49 times since then. Photos: 1, 2, 3, 4, 5, 6. submitted on April 14, 2019, by Cosmos Mariner of Cape Canaveral, Florida.